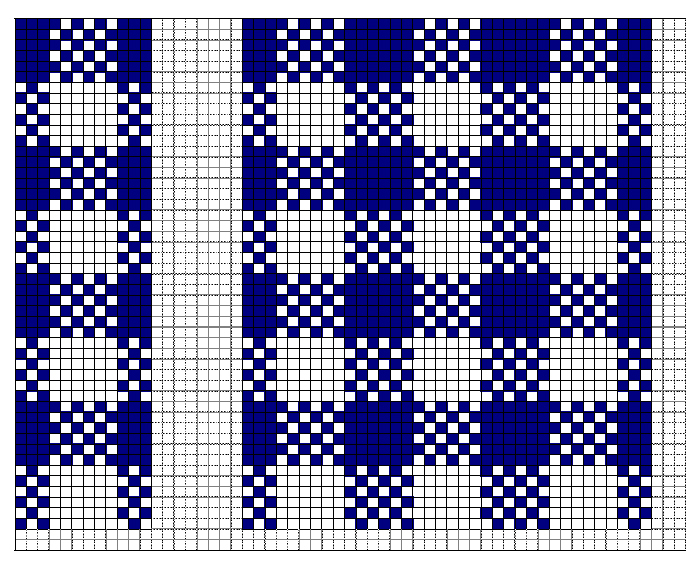 12-Stitch Machine Knit Gingham Chart | Goats and Hounds! I’ve started working 4 days per week for the company that I previously worked for. It’s been good. Part time has been agreeing with me. I do enjoy having 3-day weekends, for sure. Last weekend we had a severe freeze here and the heater in the pump house couldn’t keep up. The well head froze. Thankfully, we were able to save it, several hours later. We really thought we were going to have to buy a new pump. SOOO glad we didn’t! We had a couple of burst pipes under the house and a couple of our drain pipes froze – 2 burst; thankfully they were just drains and not water pipes. We had the plumber out yesterday to fix them. I received my “new” knitting machine and have enjoyed playing with it. One of the patterning drums is missing a tooth and the gal I bought the machine from is sending me another carriage that I can cannibalize for parts. It’s amazing how much faster fair isle knitting is on the machine! I’ve been having a few operator issues when doing colorwork, but I think I’m learning pretty well. For my kitchen curtains, I want to do a gingham check along the bottom of the panels, so I came up with a punch card pattern to accomplish this task. The rest of the panels will be in a tuck stitch pattern. This will keep the curtains a solid panel, but will give them some interest. This entry was tagged Chart, Knitting, Machine Knitting, Punch Card. Thanks for posting your patterns, they’re great. I don’t know how to use punch cards because I don’t have a machine that will take them. However I would love to have a go at your pattern on my bulky though and hand manipulate the colours. But it’s a bit too hot here for knitting at the moment (and you are probably freezing) so will put this job in my “to do” list. Hope you now have your “new” machine up and running smoothly. It is the essence of frustration when they are “playing up”. Thank you so much! I’m so glad you like them! I have a couple more that I need to put up.